What does Probation’s Rehabilitative Services Provide? 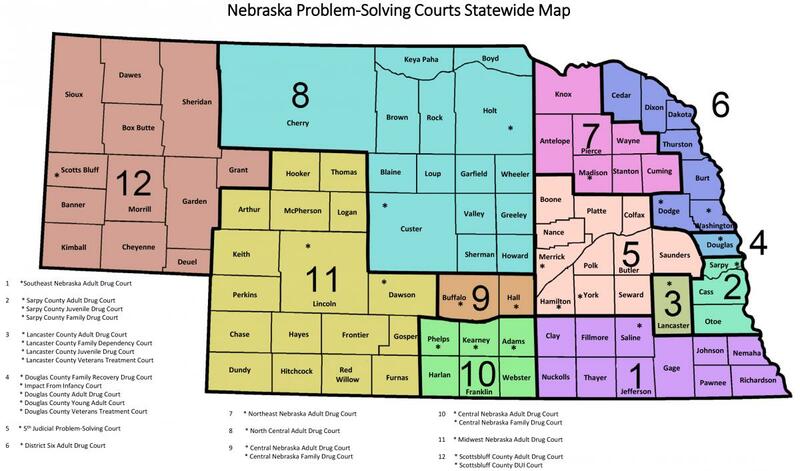 Probation and Problem-Solving Court officers use behavioral health screens and risk/need assessment tools to assist in identifying needed evaluation, treatment or other supportive services that can be ordered by the Court during Pre-adjudication, investigation or supervision. Supported by a Supreme Court rule, the Standardized Model for the Delivery of Substance Use Services is used to recognize the connection between substance use and crime/delinquency and effectively address it through treatment. Rehabilitative Services is responsible for ensuring the application of the Model and its attachments by both Probation, Problem-Solving Courts and Registered Service Providers. Implemented in 2006, the Standardized Model was updated to reflect current evidenced-based practices, language and the incorporation of co-occurring disorders. In order to provide services to Nebraska’s probation, post-release supervision and problem-solving court clients, all service providers must register with the Administrative Office of Probation. Registration requires providers to demonstrate competency in working with justice-involved individuals, agree to complete ongoing criminogenic education and agree to and adhere to established service definitions and standards of practice. This system has been designed to ensure qualified providers deliver the best possible services to all probation, post-release supervision and/or problem-solving courts clients. Vouchers are available for financial assistance and are only utilized for adults and juveniles who fall within defined risk and financial criteria. The Juvenile Family Service Access Inventory (JFSAI) and adult version (FSAI) have been created to assist officers in determining appropriate utilization of vouchers. Additionally, Registered Service Providers apply a Sliding Fee Scale, when applicable, to identify the client or families’ contribution. It is essential that these tools are utilized for the issuance of financial assistance, as research has shown persons who invest their time and resources in treatment will be more successful. Rehabilitative Services is responsible for the development, delineation, training and implementation of juvenile and adult service definitions for both behavioral health and supportive services. An extensive, multi-phased project including public comment was utilized to update all juvenile service definitions. These updated, comprehensive definitions were implemented July 1, 2017 for use by Probation, Problem-Solving Courts and Registered Service Providers. Current service descriptions and requirements can be accessed through the Juvenile Service Definitions and Adult Service Definitions. Adult Service definitions are currently in the process of being reviewed and updated with an implementation goal by 2018. Current service definitions for substance use and co-occurring services can be accessed through the Standardized Model for the Delivery of Substance Use Services, Attachment 6: Substance Use Services for Adult Criminal Justice Clients Continuum of Care. Because the vast majority of individuals coming through the justice system are experiencing substance use or use-related issues, chemical testing is an integral part of effective community supervision. Individuals on Probation or involved in Problem-Solving Courts identified with substance use issues or disorders are placed on a chemical testing schedule to initially assist in establishing a period of sobriety. As the individual progresses on supervision, chemical testing helps to showcase changed behavior. Specialized chemical testing, such as ETG (Ethylglucuronide) is used to identify alcohol use for up to 80 hours. In addition to chemical testing, supportive services such as Continuous Alcohol Monitoring or CAM, are used to help monitor alcohol usage 24/7 through an ankle bracelet worn by a probationer. The Fee for Service Voucher Committee is an advisory committee created to assist the Administrative Office of Probation to manage its Fee for Service Voucher System. The purpose of the committee is to provide technical and practical assistance to the Administrative Office of Probation, to serve as an information conduit to all community-based providers, to understand the connection between treatment and crime control, and to assist Probation in its responsibility to use State dollars in a meaningful and effective way. The committee is charged with (a) providing direction and advice on public/provider/consumer engagement and process, including direct interactions; (b) considering and balancing the concerns/issues of affected stakeholders with State funding limitations, while building public consensus for committee recommendation; (c) review the utilization of alternative funding mechanisms; and (d) make recommendations to the Administrative Office of Probation concerning the Fee for Service Voucher System as a financial aid program. For adult clients, additional supportive services may be used to support treatment interventions and ongoing accountability. Electronic monitoring can be used to promote following schedules, abiding by curfew and overall responsibility. Higher risk clients may also be monitored using Global Positioning System (GPS) technology to ensure community safety.